Procrastinating Squirrel put up a fight when I first downloaded it. From the moment I booted it up, the game started skipping like a DVD that got into a fight with a belt sander. Thus it was rendered completely unplayable. I made a video so that others could feel my pain. After publishing the original piece, I got word from a few players that they didn’t have problems. Curious, I switched consoles, then switched which storage device I was saving my progress to. While it didn’t run perfectly, the experience was vastly improved and thus I could write a full and proper review. Of course, in a way I already did that. Procrastinating Squirrel is essentially Miner Dig Deep, only not as deep. Miner Dig Shallow perhaps? Miner Dig Less Deep? Miner Scratch the Surface? 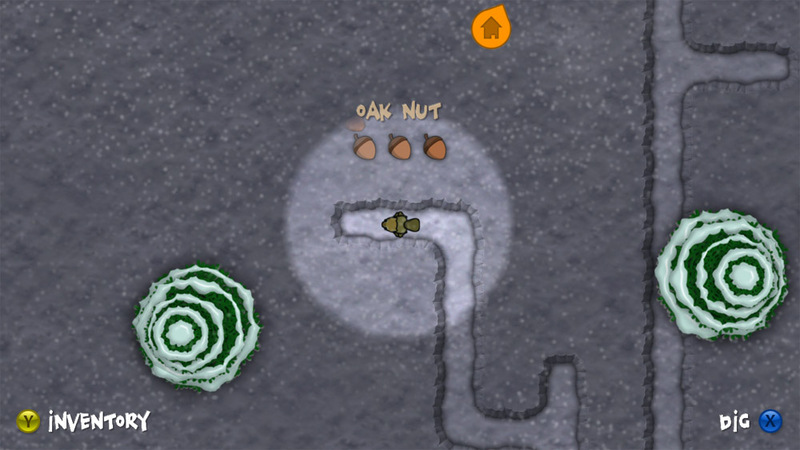 Oak Nuts. It’s what you call crazy people that live in Oakland. How about Toddlers Dig Deep? Because this stripped down version of one of my former Top-10 XBLIGs is pretty much that. Miner Dig Deep, sans strategy or most dangers. Fewer upgrades. Fewer things to mine. The boulders are still there and can still cause you to scream curse words you forgot you knew, but that’s the only thing that can kill you. There’s no need to worry about digging too many tunnels that could cave in, because the game is presented from a top-down view. That’s the one advantage Squirrel has over Miner: you can mine in any direction. Every other aspect is less than what is already offered in Miner Dig Deep. There’s no positive outlook on that. People who haven’t played Miner would be better served skipping this and playing that. People who have played Miner can only find Squirrel to be an inferior, watered-down clone. I kept waiting for the game to present some kind of hook to change things up, and finished it still waiting. While I still was practically hypnotized by the prospect of digging up new materials, those moments are few and far between. It even ends significantly faster than Miner Dig Deep. Miner Dig Deep left me wanting more. 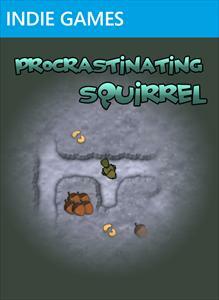 Procrastinating Squirrel left me disappointed, and recommending it would be nuts. Thirty minutes staring at the screen and that’s the best pun I could figure to go out on. I knew I should have written this sooner, instead of waiting for the Oscars to end. That’s what I get for procrastinating. 80 Microsoft Points wondered why every single pet squirrel is named “Penny” in the making of this review? i purched the game last night, had hours of brain dead fun with it and i experienced no sticking as your video showed. as played on with the xbox slim. That’s strange, I bought the game two days ago and it runs just fine. No skipping whatsoever. I just hope it gets somewhat more challenging because so far there is absolutely nothing a 4-year-old couldn’t accomplish. Well now that’s interesting, if it skips on one machine but not on another. We need more data! It runs well for me also. I have actually really enjoyed the game as well. Sorry for the trouble and hope you can play it soon correctly. Actually I’m playing it now on a different console and a different storage device and having no problems so it might be a system-by-system problem as well. I’ll have a proper review up soon. Thanks for your good grace and class during this situation. That type of skipping usually happens when you’re downloading something on your Xbox while playing an Indie Game. Nor was I when I saw this phenomenon in another game. It seems some game are just prone to it on certain Xboxes. Odd. it’s most likely the level streaming code (I believe the game streams level tiles in a background process to save on memory) coupled with a badly fragmented HDD on the reviewers xbox.